The ANKA Block-B UAV powered by the PD170 turbodiesel aviation engine (in pusher type configuration) developed by TEI as part of the Operative UAV Engine Development Project accomplished its maiden flight test in December 2018, according to schedule. Equipped with the CATS EO Reconnaissance, Surveillance and Target Acquisition System manufactured by Aselsan, the ANKA Block-B UAV with the tail number of 17-025 executed its maiden flight with the national engine in the early morning hours of December 27, 2018. The PD170 turbodiesel engine will be replacing the Thielert Centurion 2.0S (CD-155) Aviation Engine procured from abroad and utilized at the ANKA-S and ANKA-B UAVs at the first stage and then in time the PD-155 engines developed by TEI as part of the ANKA Engine Altitude Power Amplifying Project. The supercharged Thielert Centurion 2.0S (CD-155) Aviation Engines with a volume of 2.0lt, four cylinders and 155hp maximum power weighs 200kg when all its subsystems are installed (weight without the subsystems is 134kg) and its service life is 1.200 hours. On October 31, 2014, the Contract on the ANKA-S Engine Modification Project (PD-155) was signed between TUSAŞ and TEI. TEI completed the serial production of 9 PD-155 engines and delivered them to TUSAŞ on December 7, 2017. The ANKA UAV conducted its first flight with the PD-155 engine on February 22, 2018. TEI delivered one of the prototypes of the PD170 engine developed and produced as part of the Operative UAV Engine Development Project signed on December 27, 2012 to TUSAŞ on November 14, 2017 for the execution of the ground tests and ANKA UAV integration activities. The 155hp Thielert Centurion 2.0S is capable of maintaining its engine power up to an altitude of 10.500ft and the four - cycle PD170 with a volume of 2.1lt is able to generate 170hp even at 20.000ft, the power level at 30.000ft is realized at the level of 120hp. The ANKA UAV could reach up to an altitude of 40.000ft with the PD170. Speaking on the engine, the TEI Chairman of the Board and CEO Prof. Mahmut AKŞİT underlined that the PD170 with a development period of nearly 3 years it is capable of generating power of 100hp at 40.000ft and added that while the imported engine is capable of generating 96-97hp at an altitude of 30.000ft, the PD170 equipped with the two - stage turbocharger system is able to generate 130hp. AKŞİT stressed that the PD170 consumes 11% less fuel compared with the imported engine and concluded that the two high - speed alternators (one spare) for power requirements at the engine are also designed and manufactured by TEI. The design activities regarding the PD170 turbodiesel aviation engine developed within the scope of the Operative UAV Engine Development Project are completed to a large extent. As part of the maturation activities executed in parallel at 4 different engine test configurations, engine tests exceeding 4.000 hours as of December 2018 were accomplished since the first run in January 2017. The activities regarding the PD220 engine which will be an upper version of PD170 were launched as well. This engine will be powering the new generation AKINCI UAV platform developed by Baykar Makina. Two PD220 engines will remain over the AKINCI UAV. In the preliminary activities, it was witnessed that the engine is capable of generating 222hp (which is the dialing code of Eskişehir). Presently, Resistance, Reliability and Air Worthiness Tests are being conducted with the PD220 engine. Baykar Makina accomplished the delivery of 58 BAYRAKTAR TB2s (Surveillance) AND TB2-Ss (Armed) UAVs to the Land Forces Command (KKK), Gendarmerie General Command (JGnK) and the Aviation Department of the National Police until November 1, 2018. Delivering 6 TB2-S A-UAVs to the security forces on November 2, 2018, 5 TB2/TB2-S to the Naval Forces Command (DzKK) on December 16, 2018 and 6 TB2-S A-UAVs to the security forces on 28 December 2018, the company increased the number of delivered BAYRAKTAR TB2/ TB2-S Block I and Block II UAV/AUAV to 75, and the number of BAYRAKTAR TB2/TB2-S Tactical UAV/ AUAV delivered in 2018 to 37. Regarding the accomplished deliveries, on November 2, 2018, the Presidency of Defense Industries declared through its social media account that “The acceptance activities of six more BAYRAKTAR TB2-S Armed UAVs for increasing the operational capabilities of our security forces were completed successfully”. With this delivery, the number of the BAYRAKTAR TB2 TB2-S UAV/ AUAV with completed deliveries has reached 64. The acceptance activities of the first 5 BAYRAKTAR TB2-S AUAVs manufactured for the DzKK which planned to procure a total of 12 ANKA Block-B UAVs and 10 BAYRAKTAR TB2/ TB2-S UAV/AUAVs to improve its airborne surveillance and reconnaissance capabilities was completed on December 16, 2018 and therefore the BAYRAKTAR TB2-S AUAV entered the inventory of the DzKK. In the statement made via the official Twitter account of the SSB it was stated that “Within the scope of the Tactical UAV Systems Procurement Project, the acceptance process of the 5 UAV/AUAVs and their related ground systems were completed in order to be delivered to our Naval Forces”. The BAYRAKTAR TB2-S AUAVs entering the inventory of the DzKK performed their first tasks in the afternoon of December 16, 2018 in Çanakkale. On 28 December 2018, the SSB shared via its social media account that they accomplished the delivery of additional 6 BAYRAKTAR TB2-S AUAVs to the Turkish Armed Forces. 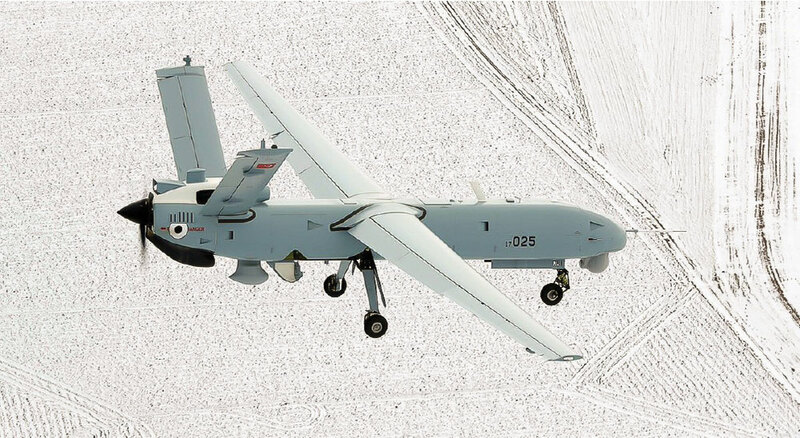 The statement followed, “Acceptance of six more BAYRAKTAR TB2 UAV/ AUAVs that are the first indigenous UAV/AUAV platforms entering the inventory of TAF is completed”. With the addition of this last delivery, the number of delivered BAYRAKTAR TB2 has reached 75 (52 AUAVs and 23 TB2-S UAVs). With the BAYRAKTAR TB2/TB2-S Block I and Block II UAVs/ AUAVs in the inventory, 42.000 hours of flight as of March 2018, 60.000 hours of flight as of 8 August 2018, 75.000 hours as of 5 December 2018 and 80.000 hours of flight as of 28 December 2018 were executed. BAYRAKTAR TB2-S Block II AUAV is capable of carrying Roketsan’s MAM-L and MAM-C and TÜBİTAK SAGE’S BOZOK Smart Munitions at the four external store stations under the wings. The first firing test with the BOZOK Smart Munition was conducted in the Gulf of Saros on November 1, 2018 and the target was hit successfully. The Fire Control Systems to be utilized in the 140 New Generation FIRTINA (FIRTINA-II) Self - Propelled (S/P) Howitzers to be manufactured at the 1st Main Maintenance Factory Directorate (MMFD) at Arifiye / SAKARYA as part of the Air Forces Command’s demands will be produced by Aselsan. The Fire Control Systems to be manufactured by Aselsan in line with the T-1555 S/P FIRTINA Howitzer Fire Control System Contract will be delivered to the 1st MMFD where the FIRTINA-II S/P Howitzers will be produced. As you may recall, upon the decree signed by President ERDOĞAN on December 10, 2018 and published on the Official Gazette dated December 20, the 1st MMC is privatized and its 25 year-long lease to BMC company was decided. BMC’s role in the FIRTINA-II S/P Howitzer Project is not clear yet. Aselsan previously accomplished the delivery of Fire Control Systems for the 281 T-155 FIRTINA - I S/P Howitzers manufactured at the 1st MMC between 2004 - 2014 and delivered in 2015. The 155/52-calibre gun and some subsystems and equipment used on the first 60 FIRTINA-I SPHs were procured directly from South Korea. Under the program, MKEK delivered the complete 155/52-calibre weapon system, Aselsan delivered the Fire Control System (FCS) and 1st MMC manufactured the platform, turret and some subsystems. The turret of the FIRTINA - II S/P Howitzer, the prototype production of which was completed in 2017, and the serial production launched in the second half of 2018 after the mobility and fire tests (the sheet cutting and turret activities of the first party Howitzers started) was completely designed by Aselsan over again and a product without foreign dependence, at a level enabling integration over any carrier platforms was revealed. The aim was for the production of around 30 FIRTINA-II S/P Howitzers at the 1st MMC within 2019 and the launch of their delivery to the KKK. Developed over the existing FIRTINA-I SPH, the FIRTINA-II SPH features some improvements over its predecessor including new turret design with ammunition (gunpowder) acclimatization/conditioning sections, fully electrical and servo controlled turret drive system (replacing hydraulics based drive system), improved Fire Control System, increased firing rate (current version able to fire 3 rounds in 15 seconds, this rate has been shortened in FIRTINA-II), extended effective range, fully automatic ammunition loading system (FIRTINA-I is equipped with electrically driven and electronically controlled automatic ammunition loading system) and integrated with Aselsan’s 12.7mm SARP RCWS for self-protection. The T-155 FIRTINA-I SPH is powered by a German MTU-881 KA 500 1,000hp diesel engine coupled with the US based Allison’s X1100-5 fully automatic transmission. The first export customer of the T-155 FIRTINA-I S/P Howitzer Systems was Azerbaijan in 2016 with an order of 36 Howitzers, but as Germany refused to grant the required license for the export of the power pack with the reason being the Azerbaijan and Armenia on Nagorno - Karabakh Conflict, the aforesaid sale could not be accomplished. Negotiations with Ukraine were conducted on the power pack to be installed on the export models of the FIRTINA S/P Howitzers as well and the Turkey Representative of the UkrOboronProm (Ukrainian Government’s Defense Industry Enterprise), the Delta Defense Industry Company shared its solution of an alternative power pack composed of the 1,050hp 5TDFMA-1 Diesel Engine and the Automatic Transmission with 7 forward gears and 1 reversing gear for the 155mm 52 caliber T-155 FIRTINA - I S/P Howitzers with the public opinion within March 2017. During those dates, it was underlined that through a series of revisions, the 5TDFMA-1 Engines would be rendered compatible with the T-155 FIRTINA-I S/P Howitzers and therefore all the existing restrictions over the export of the FIRTINA Howitzers would be abolished. In a news article written by Eray GÖRGÜLÜ at in October 2018 the Hürriyet Newspaper mentioned that an order of 20 engines for the FIRTINA S/P Howitzers was placed to Ukraine when the MKEK conducting negotiations with the Ukrainian officials and engine manufacturer UkrOboronProm received the commitment of “no export restrictions”. Whether the power pack to be procured from Ukraine would be used at the FIRTINA-II S/P is not clear yet. The footage of the KHAN (Bora) Long Range Missile hitting the target at a distance of 280 km was shared by the President of Defense Industries Prof. İsmail DEMİR via his official Twitter account of December 20th. The missile was delivered by Roketsan and its first demonstration was made at the IDEF 17’. During the footage of the firing, the KHAN missile successfully destroyed the target platform located at sea at a distance of 280 km with a pinpoint hit. With the announcement made via the official Twitter account of the Presidency of Defense Industries dated December 22, it was declared that the acceptance of 20+ TEBER-82 and 100 Precision Guided Kits was accomplished. The Teber Laser Guided Kit developed by Roketsan for increasing the impact capacity of the MK-81 and MK-82 general purpose bombs turn the aforesaid conventional bombs into smart weapon systems through utilization of the Inertial Measurement Unit, Global Positioning System and Semi - Active Laser Seeker. Meanwhile the Precision Guided Kit developed by Aselsan, Roketsan and TÜBİTAK-SAGE transform the 2000lb MK-84 General Purpose Bombs into smart munitions. The precision guided kit capable of reaching a range of 25 km at an altitude of 40.000 ft features a high precision impact capability at a deviation value of 6.3 m under all weather conditions and at high altitudes. With the help of this capability, the precision guided kit enables the aircrafts to perform their tasks in a secure manner without approaching the danger zone at the enemy’s perimeter. In line with the Multi - Functional Phase Arrayed Radar (Turkish abbreviation ÇAFRAD) Phase - 1 Contract signed by the Presidency of Defense Industries and Aselsan and launched in September 2013, Port and Sea Acceptance Tests of the radar suite prototype system manufactured by Aselsan and which will be the main sensor of the TF-2000 Anti - Air Warfare Frigate was completed successfully. As part of the tests conducted, in addition to the radar functions of the prototype system located at the helicopter platform of the TCG GÖKSU frigate, in order to demonstrate the generation of the semi - active illumination signal required by the ESSM G/M and execution of guidance, a firing with one ESSM guided missile was executed to the target drone ŞİMŞEK developed indigenously by TUSAŞ on December 11, 2018, at offshore Sinop. The ÇFR-1 System identified and tracked the high - speed target drone ŞİMŞEK while the AYR-1 System realized the guidance and illumination of the ESSM guided missile along the flight line. The target drone ŞİMŞEK was destroyed with high precision and success at the first time. Commander of the Naval Forces Full Admiral Adnan ÖZBAL and Commander of the Navy Vice Admiral Ercüment TATLIOĞLU and Aselsan personnel followed the live firing test from the TCG GÖKSU frigate. Upon the successful completion of the factory acceptance tests of the Technology Demonstration Prototype of the ÇAFRAD system composed of the IFF system with a non-rotating antenna, executing electronic scanning with the ÇFR-1 and AYR-1 systems that are the single - sided versions of the Multi - Functional Radar (ÇFR) with active phase arrayed antenna and Illumination Radar (AYR), for the provisional acceptance tests, the prototype of the system was mounted over the helicopter pad of the TCG GÖKSU Frigate in November 2018 and it was integrated to the Evolved Sea Sparrow Missile (ESSM) and to the Combat Management System at the vessel. A contract worth nearly TL 502 million was signed between Aselsan and Presidency of Defense Industries – SSB. In the company’s statement dated December 25, 2018 published at the Public Disclosure Platform (KAP), it was announced that “a contract worth TL 501,669.519 million was signed between Aselsan and the Presidency of Defense Industries on security systems”. In the statement, it was declared that the deliveries within the scope of the contract would be completed by the year 2020.